This is such a tiny little book, it almost fits in the palm of my hand, but it certainly ‘packs a punch’. It’s one of the Penguin 60s (Black) Classics series, published in 1995 to celebrate Penguin’s 60th anniversary. These little books are extracts from the Penguin Classics series, and this one comes from The Narrative of the Life of Frederick Douglass, an American Slave, first published in 1845. Reading about American slavery is, for me, a bit like reading about the Holocaust. I just don’t understand how such evil could have been accepted as it obviously was. I can understand individual acts of cruelty and wickedness as a result of some malfunction in an individual’s development, but how whole societies could have endorsed the institutionalisation of man’s inhumanity to man is a horrible mystery to me. 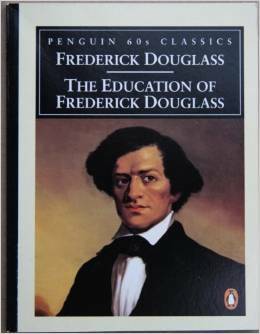 The Education of Frederick Douglass describes two kinds of education. The first is when the boy Frederick is socialised into the world of slavery and learns the rules of the plantation, and the second is when it dawns on him that literacy is the key to freedom and he sets about learning to read and write, even though he is forbidden to do so by law and by custom. Worse even than the savagery of beatings and whippings is the threat of being moved arbitrarily elsewhere, sold off at some market without even the opportunity to answer a charge or bid friends or family farewell. Frederick has one stroke of fortune. Sold off to a kindly new mistress, he is taught to read his letters. And even though the lessons are soon stopped, and the fatal poison of irresponsible power soon teaches her the cruelty she is expected to inflict, the spark has been lit. Frederick finds ingenious ways to learn to read, and then to write… and it is literacy that sets him on the path to become a national leader of the Abolitionist Movement, going on to become a social reformer, writer, and statesman. These 55 pages trace a triumph of the human spirit that remains inspirational even today. This copy courtesy of Readings, a free gift with a recent order. LOL I feel like that all the time! I used to think I was quite well-read, but not any more! I’ve made up a file of your post and Sonia’s list and SilverSeason’s hint about Project Gutenberg, so now I guess I’ve got some reading to do. It seems The Invention of Wings (Sarah Grimke’s life) which I read last year is just the beginning of a whole new reading path. Another one to add is 12 Years a Slave, which was made into a film not so long ago. Now, I’m off to bed. I’m up at the crack of dawn tomorrow to fly up to Qld for my father’s birthday! The entire narrative from which the excerpt Lisa read was taken is available free on Project Gutenberg. I read it a few years ago and was very moved by it. I started it as a history document and finished feeling great respect for an intelligent and honest man. I can’t explain or justify slavery, but I look now at long prison terms imposed for relatively minor offenses and believe we still condone great cruelty when it is socially convenient for us. Hi Nancy, I thought this probably would be free at Gutenberg, the copyright must be lapsed long ago. Still, there is something about this format which made it so easily readable, I probably would have put it aside for later if I hadn’t had it in this form. Goodness, Sonia, that’s a comprehensive list. It might be worth adding it to Goodreads Listopia so that people can refer to it. Are you a member there? (I can do it for you, if not). Lisa, I have a goodreads account but I don’t know how to create the list. Ok, go to Browse/Lists. AT the top on the RHS click Create New List, Give your list a title, a description and some tags, and then save. You can then add the books to your list! Very important novel. I must give this a re-read soon.